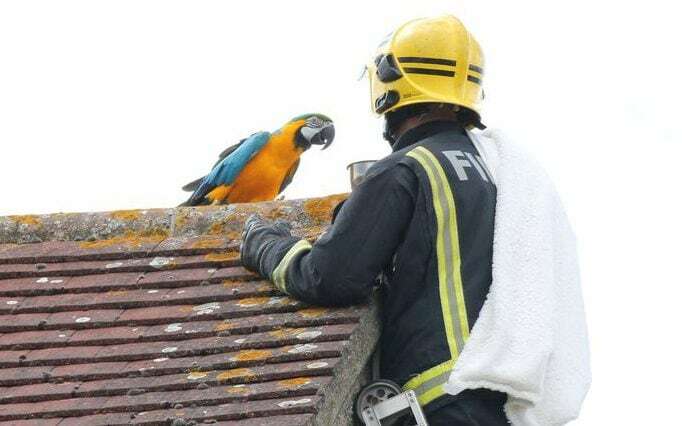 Jessie, a macaw parrot, had escaped her home and spent three days on a neighbor's roof, according to a release from the London Fire Brigade. A parrot stuck on a London roof treated firefighters who came to its rescue with a torrent of invective. The London Fire Brigade has asked pet owners to first contact the Royal Society for the Prevention of Cruelty to Animals-a British animal welfare charity-before dialing the emergency numbers, to save the service from unwarranted call outs. While the rescue was not exactly successful, as Jessie chose to fly away from the spot to another roof and then on a tree. Jessie's owner had prepared the firefighter for her potty-mouth and told the man to respond with "I love you", but the macaw kept spewing the same swear word. Jessie did reply "I love you back", but then ruffled her would-be rescuers feathers by telling them to "f-k off!" before flying off. However, helpful firefighters were shocked to receive a mouthful of abuse from the bird, who seriously needs to watch it's language. They're out there risking their lives to keep people alive, keep people safe, and they'll even tip out to rescue an animal if it gets in danger too - that's one of the benefits of having huge ladders lying around. Can't be tamed. Jessie's fowl mouthed tirade proves she's no damsel in distress. An incredibly rude parrot trapped on a roof in the United Kingdom told firefighters to "f*ck off" as they tried to help her down yesterday. As well as English, Jessie's owner taught her Turkish and Greek, so the crew also tried asking the bird to "come" in both languages. When officers from the London Fire Brigade (LFB) were called in after Jessie's owners failed to coax the bird to come down, she reportedly began shouting expletives at them.